For those that loved Clueless, the 1995 cult movie starring Alicia Silverstone and Paul Rudd, watched the TV series (1996-99) based on the film, and perhaps read all twenty-one of the Cher young adult books, well, Clueless is back, this time as a two and a half hour, acrobatically dance-heavy, in-your-face, over the top, teenage hormonal-exploding, fun-filled, six-piece band-backed musical. Produced by the ever-adventurous The New Group (Sweet Charity, The Jerry Springer Show), and adapted for the stage by Amy Heckerling (Fast Times at Ridgemont High, 1982) from her original film script, and directed by Kristine Hanggi, Clueless, The Musical is currently running Off Broadway at Pershing Square Signature Center’s smallest theater through January 12, 2018. Clueless is Heckerling’s humorous modern day retelling of Jane Austin’s 1815 novel Emma. Fascinated with the social mores depicted in the novel, Heckerling very cleverly pulled Austin’s cast of characters and basic plotlines and dropped them into the contemporary setting of Beverly Hills High School, circa 1995. Starring Emmy winner Dove Cameron (Disney’s daytime Liv and Madie), as Cher Horowitz, Clueless, parallels Emma’s well-intentioned but misguided matchmaking attempts as she approaches young adulthood. The story reminds us that learning to navigate the world of gossip, social hierarchy, and courtship are the same rites of passage that we all had to go through during our own high school years. 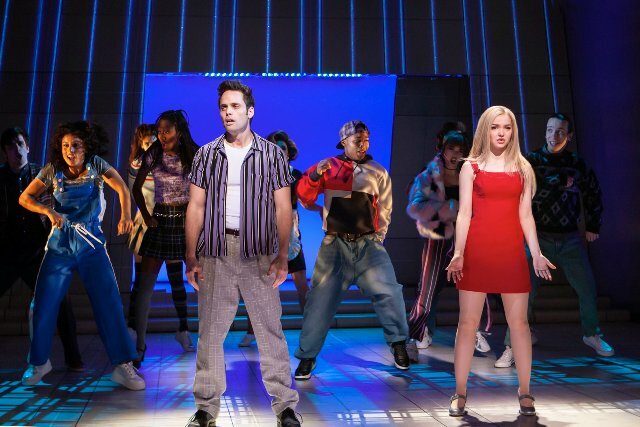 Though Heckerling has stuck with the film’s original story and structure, using popular songs from the ‘90s – some from the film’s original soundtrack – she has rewritten the lyrics to more closely match the play’s action. Sometimes this works and sometimes not. 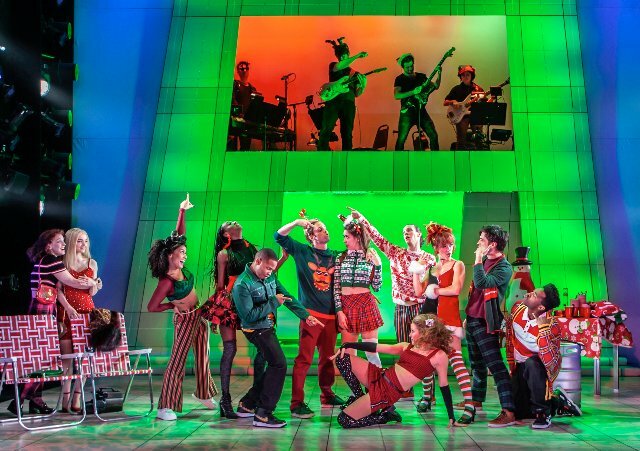 Meticulously plotted out, Clueless is comprised of forty scenes, and twenty-one songs, all equally divided among the musical’s two acts. At least half of the play takes place at high school, in class, at the gym, and in the school’s hallways. The other half finds us with Cher at her home where she lives with Mel her high-powered lawyer dad (Chris Hoch), and more often than not butting heads with her visiting step-brother Josh (a wonderful Dave Thomas Brown). When not at home Cher is on the road, going to or from a party, and in one hilarious scene taking her driver’s license test (nifty street projections by Darrel Maloney). The audience also gets to go shopping at Barney’s with Cher and her bestie friend Dionne (Zurin Villanueva) and watch as Cher tries on eye-popping outfits (compliments of costume designer Amy Clark). Throughout the production we are seduced by choreographer Kelly Devine’s highly energetic dance numbers and serenaded by songs (with Heckerling’s new lyrics) originally sung by such groups and performers as TLC, Michael Bolton, M.C. Hammer, En Vogue, N’Sync, Dee Lite, and Des’ree. Carrying the entire show on her back – her name is the title of the musical after all – is Dove Cameron. She is the Queen of every scene, as well as the play’s narrator, occasionally delivering snappy Heckerling-written asides directly to the audience. Cameron, a true Disney-looking star resembles a young Kristen Chenoweth. Both actresses are blond, on the tiny side, can act, dance, and send their voice up towards the heavens; in this case the balcony. Of course, a Queen needs a stellar cast to prop up her reign. Here we meet all 17 of Clueless’ characters, some in cameos, and a couple playing more than one role. The main leads, all recognizable stereotypes from the film, are a hoot to watch. You could tell that the entire cast is loving this musical and all of the joyful responses coming from the audience. The night I attended the theater was filled with high school kids, all of who cheered loudly. There are a lot of twists and turns and about faces in Clueless, enough to keep you on your toes. Cher, a born instigator, is relentlessly energetic on all fronts, from cleverly tricking teachers into raising her report card grades by offering countless excuses as to why she did not get an A. Her excuse, “I just got dumped, it really messed with my head”, manages to get her gym teacher to raise her grade. Another teacher raises Cher’s grade after Cher says the she is organizing a pollution law letter-writing campaign. However, Cher’s main preoccupation, other than shopping and makeovers, is making romantic matches. Some succeed, others fail. The most ingenious, well-plotted matchmaking feat, also the most heart-warming adult hookup is between her debate teacher Mr. Hall (Chris Hoch) who gave Cher a C, and another teacher Miss Geist (Megan Sikora). Shakespearian in its complexity, notes are forged and planted, rumors are started, a makeover takes place, and tickets linking the two teachers to a Mozart concert enter into the fray, all with the purpose of having Mr. Hall raise her grade. Triggering this set-up was Cher’s simple thought that happy people give happy grades. In another makeover scene, Cher and Dionne, decide to take Tai (Ephie Aardema), a newly enrolled high school student under their wing. With a new hair style, makeup and a tight fitting dress Tai morphs from an ordinary looking girl, to a beauty. In no time at all, catching the eye of Travis (a charismatic Will Connolly) one of the schools stoners, another possible love couple emerges. Fabulous Footwork and Fanciful Fashion aside, riding on the crest of all this high energy intrigue, the relationship between Cher and Josh, obvious to the audience from their very first butting of heads, begins to heat up for real. Soon we are at a wedding. Not Cher’s or Josh’s. You will have to see the play to guess whose. As the play comes to a close, love is in the air, and the entire cast is on stage kissing, dancing and feeding each other cake to the tune of Kim Wilde’s Kids in America. One could not wish for a more uplifting ending. Cast: Dove Cameron (Cher), Ephie Aardema (Tai), Sara Andreas (Heather), Gilbert L. Bailey II (Murray), Dave Thomas Brown (Josh), Will Connolly (Travis), Tiffany Engen , Danielle Marie Gonzalez (Lucy), Tessa Grady (Amber), Talya Groves (Summer), Chris Hoch (Mel, Mr. Hall, DMV Instructor), L'ogan J'ones (Max), Darius Jordan Lee (Sean), Justin Mortelliti (Christian), Megan Sikora (Miss Geist, Ms. Stoeger), Brett Thiele (Elton), Zurin Villanueva (Dionne), Katie Goffman, Tiffany Engen Jeff Kuhr (Female Swings),Jeff Kuhr (MaleSwing).